Protect CPUs and PCs from unauthorized access and harsh environments. Secure laptops, servers and PCs in these lockable computer cabinets. They're ideal for office use and in industrial environments and are all guaranteed for life. Lock down your CPU and prevent unauthorized access and tampering. 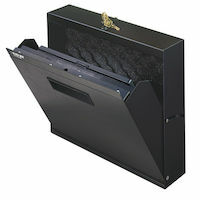 Cabinets feature a three-point lock, a slide-out tray, and generous ventilation to prevent heat buildup. Protect your laptop—and data— from theft and vandalism. Cabinets can hold up to 17-inch laptops. 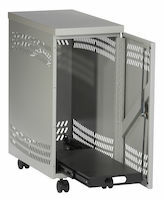 A stationary security cabinet stores and protects up to 35 laptops. Protect computers from dust, dirt, grease and moisture with the PC Shelter. It's designed for use in factories, warehouses, machine ships and food-service facilities. Keeps CPUs away from prying fingers. The lockbox designed exclusively for laptops. The economical way to protect PCs in hard-working environments.